Sadly, we can't take pictures without a camera. Here's a quick summary of a few items the beginner might want to add to shoot nice pictures. Photography can get very expensive in a hurry. What you purchase will depend a lot upon the level of photo quality you seek. Depending upon your budget, there are a number of helpful items you might want to consider purchasing for your photo efforts. If you are serious about wanting to take good photos - there's one investment you'll have to make: a high quality digital camera. Cheaper versions will never give you the depth in coloring that great photos require. I know basically zilch about cameras - and simply relied on Consumer Reports for my decision - as I do with most household appliances. I'd suggest you follow their unbiased advice as well. An item that is almost indispensable is a camera tripod. 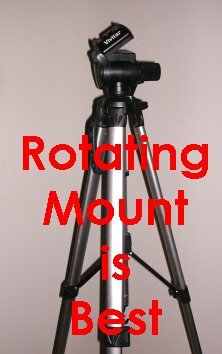 One feature that's essential for your tripod is a mount - that not only turns horizontally - but vertically - as well. Without it - you'll lose the ability to shoot highly focused shots & poses. The first stand I purchased was only two directional. I was forced to replace it quickly. Walmart carries these stands at an affordable price. You'll also need an adapter for attaching the camera to your stand. These are a standard accessory at any camera store - and simply screw to the base of the camera - and lock into place via grips on your stand. We gals all tend to love a mirror. *Smile* However, buying a cheap pose check mirror can prove invaluable to the beginning model. I used to situate my mirror on a wall behind my camera where I could check my pose in between the time I set the timer - and jumped into place. This made a huge difference in the quality of my shots. Honestly, I'm a bit too lazy to do this any longer - and I've shot enough photos to know what will probably look right. However, in the beginning - this was a very powerful and affordable accessory to help me with improving my poses. You can buy a cheap full length mirror from Wal-Mart or Target for about $5.00. Obviously, you'll need some photo editing software to cut, clip & adjust your pictures. This - is a little beyond the focus of these tips - and certainly outside my realm of expertise. I use Paint Shop Pro - simply because I started with them years earlier - and feel comfortable working with that software. Photoshop is the most popular brand. Like most females - I waited a couple of years before I finally read the directions to use this software in detail. this - was a capital mistake. These programs can enhance certain details of your photographs lighting to create a powerful effect. I'd suggest you invest a suitable amount of time working through the tutorials to enhance your skill in creating great photos.